Pioneer Ent./Geneon(original licensor); FUNimation(new licensor) AIC, GAGA Communications, Pioneer Ent. The Demonic Intergalactic criminal known as Kain has escaped from his prison, completely destroying the Galaxy Police Headquarters in the process! Traveling back in time, his one target is the source of the Juraian bloodline... Tenchi's mother. 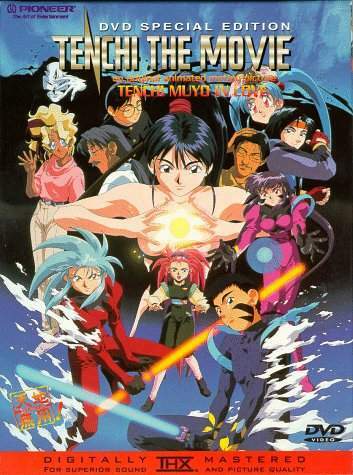 In the process, this causes the history of Tenchi and the girls to be nearly erased, until they are saved by Washu. The only hope of stopping Kain and making things right again is to travel back in time and stop Kain from harming Tenchi's mother. Washu sends the gang back to 1970 on a mission to look after and protect Tenchi's mother, Achika. Posing as the staff/students of her school, they learn and experience how Achika and Nobuyuki (Tenchi's dad) first met. As the gang get closer, the danger of Kain reaches its climax.